I had a little teaser picture over the weekend for this recipe, and a couple people guessed what it was! 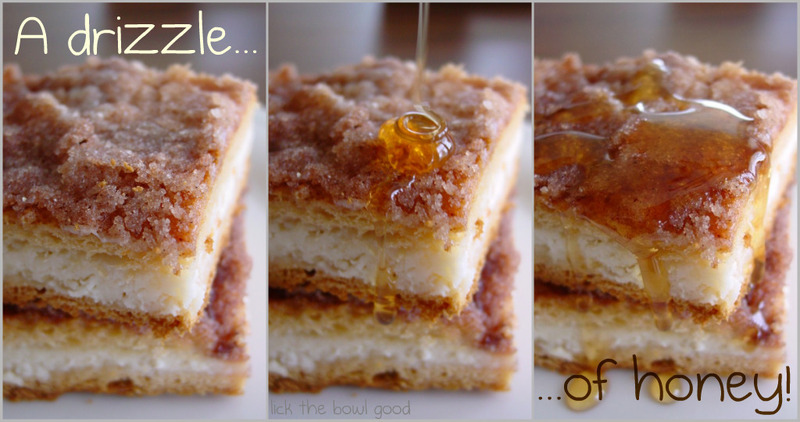 This ugly but delicious recipe is Sopaipilla Cheesecake! Ever had a sopaipilla? Even know what a sopaipilla is? Well let me tell you. Here in Texas, we can get sopaipillas at Mexican or Tex-Mex restaurants as dessert. It's a deep fried piece of dough that puffs as it cooks, making a pillow of sorts. They're served warm with a side of butter and honey for drizzling in the center or on top of them. See picture here. They're super light and airy, the slightest bit chewy and sweet. I've had sopaipillas dusted with powdered sugar, plain with honey, drizzled with chocolate sauce and now with cinnamon sugar. The recipe calls it cheesecake, but these are more like cheesecake bars as they consist of a crust on the bottom and the top of the sweetened cheesy filling. This is by no means a low-cal dessert, although you could use neufchatel or reduced fat cream cheese as well as reducing the sugar and using margarine in place of the butter. However, if they taste like dirt, don't be complainin' to me! This recipe came together in a matter of minutes. I wasn't so sure they would amount to much, flavor wise, because it was rather ugly looking, but sometimes those are the best recipes. Can I get an Amen?! The best part, in my opinion, was the flaky buttery cinnamon sugar on top of the crescent dough. It reminded me very much of cinnamon toast...with a side of cheesecake. Does it get better? I preferred these cold because I don't like warm cream cheese, but slightly warmed with a drizzle of honey would also be delicious. I would definitely make these again, only next time I'd increase the filling. You can never have too much filling! Using a greased 9 x 13 baking pan, unroll one package of refrigerated crescent rolls. Line the bottom of the pan and flatten, pinching seams together as you go. In a medium bowl, add together the cream cheese, sugar and extract. Mix til well blended. Spread mixture over the crescent rolls. Unroll the other can of crescent rolls and place on top of cream cheese mixture. Pour one stick of melted butter over the top and sprinkle with about 1/2 cup of the cinnamon sugar mixture. Bake at 350 degrees for 30 minutes. Allow to cool, eat at room temperature or serve chilled. Refrigerate any leftovers. Hope you have a great day. Thanks for stopping by! They don't look ugly - delicious more like! Cinnamon toast with a side of cheesecake - yes please! Oh my goodness, how can you say these are ugly? How delicious is that??? I'm definitely trying this. They sure don't look ugly to me. Yummy pops into my mind. No way are those ugly Monica...are u crazy???? They look mouth watering. I am going to try these soon. They are my type of recipe! I LOVE sopaipillas! You better believe I'll be tryin' this!! I think these look delicious. They're not ugly at all. And, if you had a square cake stand, you could pop them on top and put fresh fruit or something around--just saying = ) !!!!! I want one of everything you have made! I am sooooooo happy to have stumbled on your blog this morning. That is true beauty right there, nothing ugly, just yummy sweetness! This is such a delicious dessert. A friend of mine shared her recipe with me last year after she brought this cheesecake to a party. It's so easy! Your pictures are fantastic. This looks so amazing! 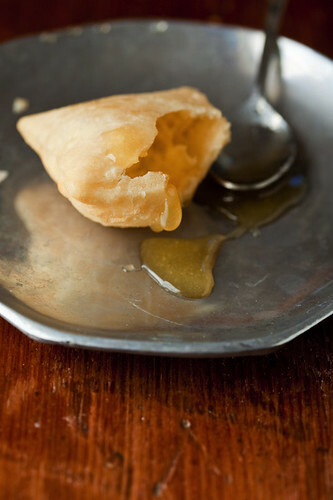 Around here, they serve savory sopapillas too, which are my absolute favorite thing in the world. The sweet version is delicious too, though, and I love that you turned it into a cheesecake! They look delicious to me! Maybe I'll make these for my work birthday treat! Would you just make 1.5x the cream cheese mixture? Or double? I like more filling too. 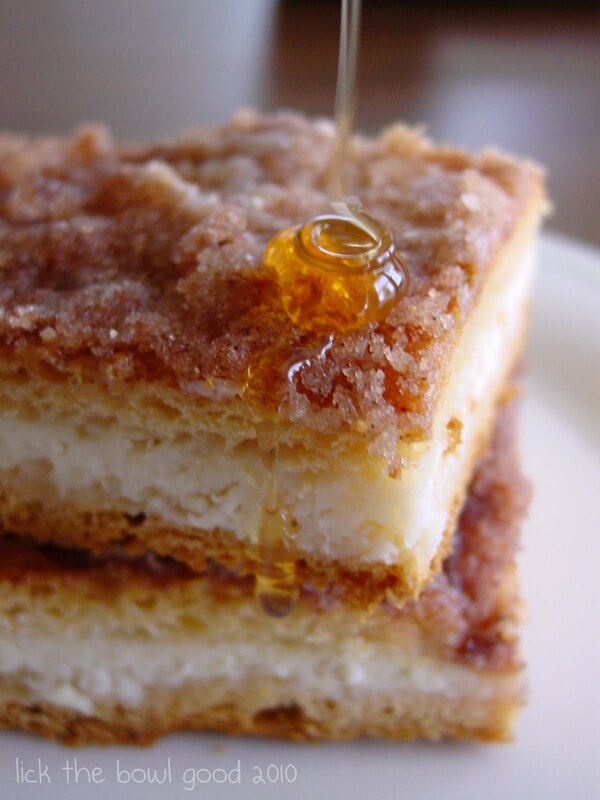 Mmmmm...I grew up on sopapillas! These look fantastic! I've had sopapillas but never in cheesecake form. I'll take two please! OMG! I LOVE Sopaipillas!! And it's rare to find them here in florida. I'm trying this recipe this weekend for sure! I don't think they are ugly at all! I have a recipe from a lady at our old church for something called cheesecake bars. She brought them in for coffee hour and I remember they were made with crescent rolls. I'll have to look to see if it is the same recipe. If so, they are delicious. Yours look thicker than I remember hers being. You don't like warm cream cheese? I like cream cheese any way! You are too hard on yourself because those are FAR from ugly! That dripping honey is killer. I don't think they look ugly at all! I tried to take a picture of no-bakes a few weeks ago - now those are ugly :) But these look delicious! So funny that you posted this recipe! My mom made this a few weeks ago and again this past weekend for our Pastor Appreciation at church :) It is a hit, especially for men! My husband & my dad couldn't get enough of it! AMEN! LOL, those are NOT ugly by any means or stretch of the imagination, Monica! I just love, love, love that photo of the honey dripping on! i think it looks delish! i made this for a cinco de mayo party and people went crazy, almost everyone asked for the recipe. i eat gluten free so i couldn't taste it but apparently it is quite tasty!! not sure why i torture myself with your blog but everything just looks so yummy i think i should make it for my husband! im getting hungry just looking at this. they look fantastic. thank you for sharing. Thanks also for entering my CSN stores contest!!! what ugly? these are gorgeouss!! Monica! These are far from ugly! I've never heard of this before, but it sounds delicious. I'll give you an Amen. Pass a slice here, please. Amen. I love that drizzled honey. No way is this ugly, by the way. Amen. Amen to that! Fast, easy, looks delish (what is not to like? Cream Cheese, Croisants and Cinnamon? yummy) and not ugly! Doesn't look ugly to me....looks totally wonderful! Mmmmm! I've had these, but we don't call it sopapilla cheesecake! It's sooo yummy. They aren't ugly at all. One of my coworkers brings this in when we have brunch at meetings and we enjoy it with coffee. I've used reduced fat cream cheese and reduced fat crescent rolls and it still comes out great! Ha-ha! Love the title. Trust me, mine was truly ugly. Unlike yours which looks pretty darn tasty if you ask me. These look delicious! I am going to make this recipe for sure. I made these on Saturday night for a party I had on Sunday. The recipe went together very quickly, although I had some difficulty getting the to layer of crescent rolls on properly. I also used low fat cream cheese. the house smelled totally amazing while they were baking. All that buttery cinnamony goodness was divine. They are/were delicious! They were the most favorite thing of all the things I baked for the party, and that included a caramel apple tart that was to die for. I cut them into little triangles and it made bunches. I sent the leftovers to work with my husband on Monday and the guys he works with loved them with thier morning coffee. I highly recommend this recipe if you're looking for a yummy treat. Thanks for sharing it with the rest of us! My family loves these! We have been making them for a few years now but the recipe we use has you put your favorite pie filling on top & a scoop of Vanilla Ice-cream-YUMMM! Try it. love your blog... was totally surprised when i saw the word sopaipillas! My Dad made them all the time when i was groing up, he is from Durango,Mexico... going to make this treat today!! Thanks for sharing!! I've made Sopapilla Cheesecake for years! It's my most requested recipe for potlucks! Haven't made it for the family in a while, that just might happen for Thanksgiving! It's in the oven. I halved the recipe as I had only one pkg of crm cheese and one roll of cresent dough. It was so easy! Thanks! I have made these 4 times in the past two weeks for various events. They were a HUGE hit every time. Thanks for the great (and easy) recipe. these are so delicious!! another twit on them... put a can of pie filling on top!! cresent rolls, then crm cheese mix, then pie filling, thne cresent rolls. Delish! !